You started smoking cigarettes around the time you were in high school. It quickly became a part of your personality. At some point, you developed a bad sore throat and thought, “Oh my God, please don’t let this be cancer.” You decided to quit for the first time. After your throat got better, one stressor leads to another and you decided to switch to the tin of chewing tobacco rather than squares. Sounds too familiar, right? 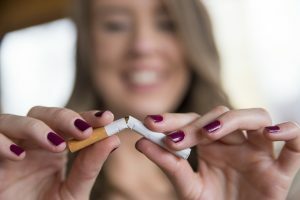 Ultimately, you gave into your addiction and justified it with, “It’s my only bad habit.” Your Sunnyvale dentist understands how difficult it can be to quit using tobacco, we run into patients that use it all the time! However, that does not make it any better for either your general or oral health. If you think that going smokeless is better for you, think again. Tobacco—no matter what form—is chipping away at your well-being. Is smokeless tobacco any better for you? When you stick a glob of smokeless tobacco in the side of your cheek, think about what it’ doing to your mouth and teeth. All the chemicals that make “chew” so addictive are being absorbed through your gum tissue, cheeks, and throat. It eats away at your gums, causing bone loss and recession. It increases your risk for gum disease and tooth decay. It leaves white and red lesions in the mouth that can turn to cancer. It causes chronic bad breath. It dulls your sense of taste. It slows your mouth’s natural healing process, especially after an oral surgery procedure. How can Dr. George T. Philip help me? The best thing for your overall health is to quit using the product altogether. It’s not easy due to the nicotine found in tobacco products, but Dr. Philip and our dental team are here to help make your health a priority over those addictive moments. Even if you are having a hard time quitting, it is important to visit your dentist for regular checkups before you’re showing any symptoms of a dental issue. Preventive care including oral cancer screenings is necessary to stay on top of your oral health. Most times, when you actually start feeling pain from your tobacco use, severe health problems had begun long ago. The survival rate for oral cancer is about 83% if addressed in the early stages. Your dentist in Sunnyvale can spot signs of infection and disease and develop a plan to get your oral health back on track. Contact us today to make your first judgement-free appointment and oral cancer screening!